Gustav MAHLER: Symphony No. 10 (1910; rev. Yoel GAMZOU, 2003-10). 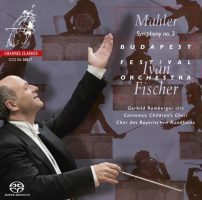 International Mahler Orchestra, Yoel Gamzou (cond.). Wergo WER 5122-2 (1 CD) (http://www.wergo.de/). Cooke’s version remains the established solution to this puzzle. Eager and industrious Gamzou wedges pieces where they don’t quite fit and worries seams that had held just fine. Adjustments appear as early as the Adagio, which ought to be hands-off. The movement starts astoundingly softly, perhaps too quietly. Later on the strings can’t handle the Adagio’s heights and intensity. Gradually we discern Gamzou’s curious tempos and modifications. He likes crescendos that end with accents and these become pretentious and excessive jabs not just because Cooke & Co.’s pitches and patterns are familiar. Purgatorio is no longer a tidy scrap, but bloated and wandering with unhelpful scribblings in the repeat. It becomes a bit of a game to guess what lies around the corner, like anticipating whether a rogue chef might festoon a sweet dessert with chopped parsley. Unintentionally, Gamzou’s approach suggests that Mahler would have tightened up and made the last two movements more distinctive. Cooke did a good job disguising how problematic the second Scherzo and Finale are. Gamzou brings Scherzo II into line with the frenzy of the Ninth’s Rondo-Burlesque which makes sense in spirit even if the material is insufficient. Given how the Sixth’s hammer blows were revised, I suspect the Tenth’s drum beats would have been adjusted and that less of the Adagio would have been reprised. The additional lone clarinet tossing out piercing motivic bits is simply silly. At least Gamzou avoids using the skeleton to quote previous Mahler symphonies. 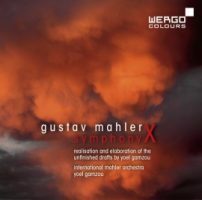 Gustav MAHLER: Symphony No. 10 (1910; rev. Deryck COOKE, 1966-72, rev. 1989). Seattle Symphony, Thomas Dausgaard (cond.). 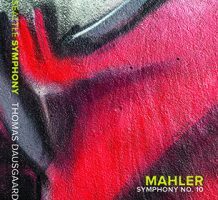 Seattle Symphony Media SSM1011 (1 CD) (http://www.seattlesymphony.org/). This Tenth has surprised and delighted me. I have not heard Seattle sound this good, and am surprised to hear such clarity and enthusiasm from them. Until now I associated Dausgaard with Nielsen and Langgaard, but now can think of him as an accomplished and probing Mahler interpreter. What impresses most is that all five movements contribute to a cohesive shape. The strings do not fail in the Adagio or Finale. The Finale’s solo flute is not bittersweet and the sunnier parts are just brisk enough to prevent melodrama. Dausgaard proves that Cooke’s edition remains the most satisfying, and that it allows a poignant performance. Captured during live performances in November 2015, this supple performance steps a few paces ahead of Rattle’s second recording from 1999, with the Berliner Philharmoniker (EMI 7243 5 56972 2 6). In its entirety, Dausgaard wraps it up several minutes faster than Rattle. Gustav MAHLER: Symphony No. 3 (1893-99). Gerhild Romberger (alt), Cantemus Children’s Choir, Chor des Bayerischen Rundfunks, Budapest Festival Orchestra, Iván Fischer (cond.). Channel Classics CCS SA 38817 (2 SACDs) (http://www.channelclassics.com/). Fischer pulls No. 3 into bright light, shaking off dust. I haven’t been compelled to listen as closely to the often indulgent Third in years. Fischer may shed aspects of the first movement’s wackiness and rambling monotony (what some may call Mahlerian), but the smaller set pieces in the second half (movements four and five) are spot on. The brief fifth movement (“Lustig im Tempo und keck im Ausdruck”) made a strong impression. Fischer confidently marks details smudged elsewhere: For example, when the chorus unexpectedly takes a refrain in a jarring minor key. The fifth movement closes with unexpected melancholy which transforms delightfully into the Finale’s sublime awakening. There are no histrionics in the final minutes, the walls will not come tumbling down, and this may disappoint bloodthirsty Mahlerians. Fischer might argue that the journey is more important than the arrival. Anton BRUCKNER: Symphony No. 7 (1881-83). 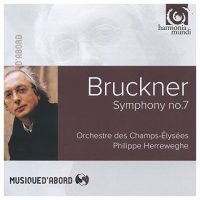 Orchestre des Champs-Elysées, Philippe Herreweghe (cond.). Harmonia Mundi HMA 1951857 (http://www.harmoniamundi.com/). Harmonia Mundi reissues what had been a startling, original-instruments rendition of one of Bruckner’s big symphonies. Eleven years on, the first two movements still offer magical harmonic suspensions and unexpected balances between modest strings and winds. My opinion hasn’t changed terribly much from then, but the last two movements, whether because of balance or energy, sound limper than I recall. I wonder if they are taken from a different performance; the mood shifts that much. Those who expect a thunderous Finale will wonder if a repeat was forgotten as the heavens never have a chance to part. 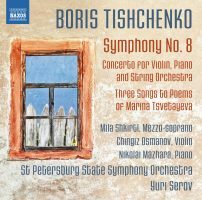 Boris TISHCHENKO: Concerto for Violin, Piano and String Orchestra, Op. 144 (2006); Symphony No. 8, Op. 146 (2008); Three Songs to Poems of Marina Tsvetayeva, Op. 48 (1970; arr. Leonid REZETDINOV, 2014). Chingiz Osmanov (vln), Nikolai Mazhara (pno), Mila Shkirtil (m-sop), St. Petersburg State Symphony Orchestra, Yuri Serov (cond.). Naxos 8.573343 (1 CD) (http://www.naxos.com/). Perhaps all listening experiences are tinged by what has been heard before. I have listened to more Schnittke than Shostakovich these last months, and to my surprise, I hear aspects of the former in Tishchenko, even though it is well known and immensely audible that he had studied with the latter. Double concertos for violin and piano are unusual, and examples by Mendelssohn and Chausson come to mind. Tishchenko accompanies the pair with string orchestra. His melodies reflect Shostakovich’s powerful gravity, however the Concerto’s first movement’s intensity, a quasi-canonic Fantasia including aleatoric gestures and improvisation, emulates Schnittke’s systems that gyrate out of control. The remaining three movements are more thematic, exploring folk tunes. The bright, second movement Rondo asks the pianist to gently touch the strings in order to create percussive overtones. The sober third movement Interlude is for the accompanying string orchestra, and despite its title, the closing Romance is fairly despondent. The Eighth is slighter, barely 19 minutes (the Concerto was 33:16), and emerges from Schubert’s familiar unfinished Eighth which it is designed to follow in performance. It’s not that Schubert flows seamlessly into Tishchenko, but the transformation quickly passes through Mahler and, yes, Shostakovich. Tishchenko develops a motive borrowed from Schubert which as it grows simpler (its intervals become narrower) also brought to mind the principal theme of Schnittke’s Eighth. However, Tishchenko does not dwell and easily alternates light and dark. The three Tsvetayeva songs are short, but striking. The second, The Leaves Have Fallen, bears repeating because of Shkirtil’s clear and focused diction. 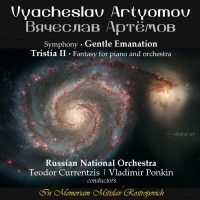 Vyacheslav ARTYOMOV: Symphony of the Way: Symphony No. 3, “Symphony: Gentle Emanation” (1991; rev. 2008)1; Fantasy for piano and orchestra, “Tristia II” (1998; rev. 2011)2. Philip Kopachevsky2 (pno), Mikhail Philippov2 (speaker), Russian National Orchestra1,2, Teodor Currentzis1, Vladimir Ponkin2 (cond.). Divine Art DDA 25144 (1 CD) (http://www.divineartrecords.com/). Artyomov commands a master’s palette that freely swivels between the contemporary Russian tradition of Shostakovich and Schnittke, Messiaen’s vibrant chords and colors (which can be traced back to Scriabin), and the German Expressionism of Berg and Henze. Gentle Emanation is in 28 continuous parts bracketed into three movements, and isn’t all that gentle but actually assertive and dynamic. In fact, the title refers to a phrase which appears in the Book of Job in the Russian Bible, a moment just before the appearance of God. Thus the symphony is about nearing the divine. It is a colorful, swirling 41 minutes. Tristia II’s 11 episodes, with text by Gogol, passes in a single spread. The solo piano roams around as a dispassionate, virtuosic soloist. Other than the appearance of Gogol’s prayer to his guardian angel or muse, this could be an early Messiaen castoff, except that Artyomov’s fluency in intensely crafted set pieces suggests maturity and vision.